The philosophes (French for philosophers) were the intellectuals of the 18th century Enlightenment. Few were primarily philosophers; rather, philosophes were public intellectuals who applied reason to the study of many areas of learning, including philosophy, history, science, politics, economics and social issues. They had a critical eye and looked for weaknesses and failures that needed improvement. They promoted a "republic of letters" that crossed national boundaries and allowed intellectuals to freely exchange books and ideas. Most philosophes were men, but some were women. They strongly endorsed progress and tolerance, and distrusted organized religion (most were deists) and feudal institutions. They faded away after the French Revolution reached a violent stage in 1793. Newton's formulation of the three laws of motion and law of universal gravitation prompted many Europeans to approach all study of nature through reason and logic. The philosophes were a result of this new approach to learning who encouraged reason, knowledge and education as a way of overcoming superstition and ignorance. 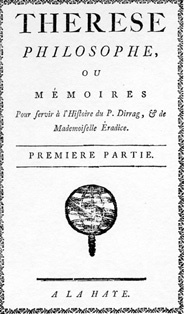 Philosophes Denis Diderot and Jean le Rond d'Alembert edited the Encyclopédie (1751-1772,) which represented the philosophe belief that everything could be known, classified and understood by man. It also questioned religious authority and criticized social injustice. They believed that the role of philosophy was to change the world, not just to discuss it. Because it was illegal to openly criticize the church and state in France, many wrote plays, novels, histories, dictionaries, and encyclopedias with subtle messages attached. An example is Montesquieu's Persian Letters. These philosophes cool, such as Frederick II, the Great of Prussia, Catherine II, the Great of Russia, Maria Theresa of Austria, and Joseph II of Austria. These were the enlightened despots of the time. Many philosophes rejected organized religion, believing that it was holding back human progress. Those philosophes critical to religion claimed that Catholicism prevented humanity from seeking improvement and equality, by teaching ideas such as divine right and by supporting the privilege of the nobility. Many philosophes cam to believe religion promoted intolerance and bigotry. These philosophes did not espouse atheism through rational enquiry. Some philosophes, such as Voltaire, did not believe in organized religion itself, but believed it had the purpose of controlling the masses. Also the idea of "Deism" or a watchmaker type god was influencial. A watchmaker god is the theological theory that an incomprehesibly intelligent being created the universe and then left it to its own devices. Most philosophes denounced slavery because it deprived people of their most basic rights. One of the most well known "anti-slavery" philosophes is Josiah Wedgwood, a potter. He designed and produced thousands of anti-slavery medallions, which some fashionable people wore or put up on display in their homes. Some of the other things philosophes denounced are: torture and/or cruel punishments for crimes, inhumane treatment of the mentally ill, and mercantilism. A certain group of philosophes called "physiocrats" searched for "natural laws" to explain economics. These "physiocrats" opposed mercantilism (a closed trading system that influenced the economic policies of most governments at the time), many argued that land, not the gold and silver that many kings were hoarding, was the true source of wealth. Through this they encouraged farming and a free market, a market in which all goods could be bought and sold without restraint. Unless indicated otherwise, the text in this article is either based on Wikipedia article "Philosophes" or another language Wikipedia page thereof used under the terms of the GNU Free Documentation License; or on original research by Jahsonic and friends. See Art and Popular Culture's copyright notice. This page was last modified 07:53, 11 May 2013.